Dirty Coke Cake - our favorite drink in cake form! Homemade buttermilk chocolate cake and fudge frosting spiked with coconut and lime. SO good! Great for a potluck and tailgate party! A CRAZY delicious cake recipe! Have you ever heard of a Dirty Diet Coke? It's a thing, you know!?! In case you aren't' familiar with the wonderful Dirty DIet Coke, it is a Diet Coke with coconut syrup and lime. I heard about it from my friends that live in Utah. Swig N' Sweets is famous for their Dirty Diet Cokes (and their cookies are dang good too!). I love Diet Coke, and a Dirty Diet Coke is a fun way to jazz up my favorite beverage. 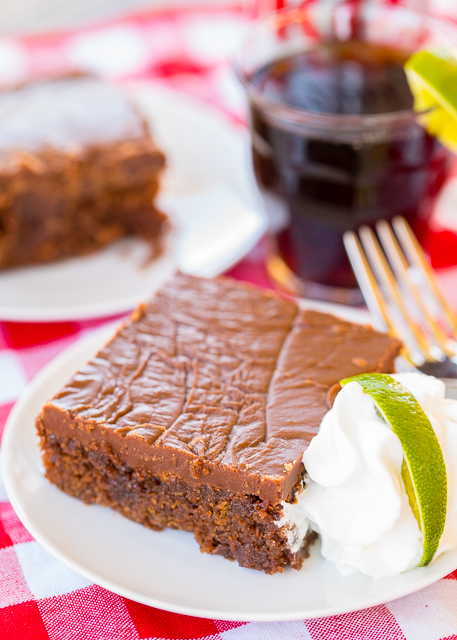 Coca-Cola Cake is one of our favorite desserts. Chocolate cake made with Coke - so good! 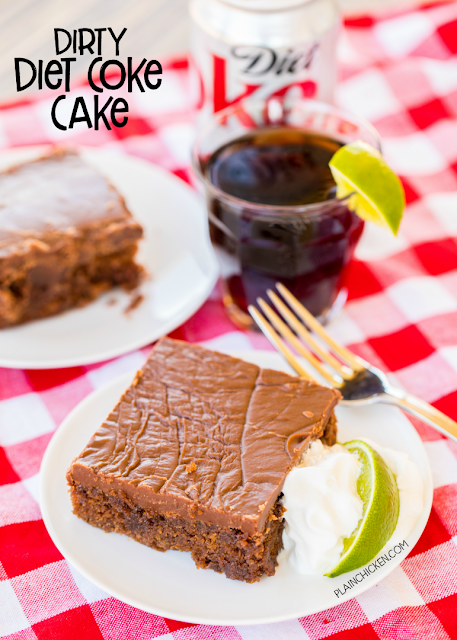 I was thinking of desserts for our Memorial Day cookout and thought why not make a Dirty Diet Coke Cake!?!?! OMG! Y'all, this is SO good!!! We both ate WAY too much of this cake. 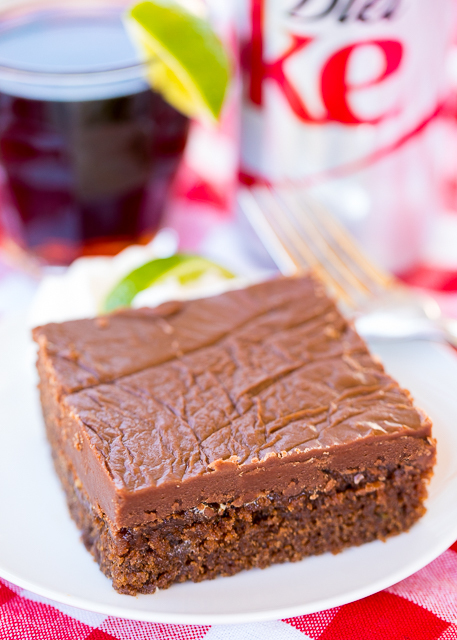 Chocolate cake and Diet Coke - I can't think of many things better in this world! I used coconut extract in the cake. I didn't think most people would have coconut syrup in their pantry, so I used the extract. It worked great. I used fresh lime juice and zested the limes. Perfect!! You can make this cake a day in advance and store it in an air-tight container until you are ready to serve. I hope y'all enjoy it as much as we did!! Preheat oven to 350º F. Grease and flour a 9x13-inch pan. Set aside. In a large bowl, sift sugar and flour. Add marshmallows. In saucepan, mix butter, oil, cocoa, and Diet Coke. Bring to a boil and pour over dry ingredients; blend well. Dissolve baking soda in buttermilk just before adding to batter along with eggs, lime juice and coconut extract, mixing well. Pour into prepared pan and BAKE 35 to 45 minutes. Remove from oven and frost immediately. To make frosting, combine butter, cocoa and Diet Coke in a saucepan. Bring to a boil and pour over confectioners' sugar, blending well. Add lime juice and coconut extract. Spread over hot cake. Do you have to use diet soda? Could I use a regular Coke? Regular Coke will work fine. Enjoy!